German supermarket chain Rewe has announced that it is launching a new private label brand in support of its recently-established chain of convenience stores. 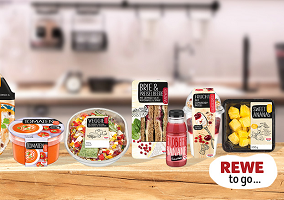 Named Rewe To Go – the same as the stores themselves – the new brand line up is said to offer a diverse range of products focused on on-the-go consumption. For breakfast time, the German retailer is offering “delicious mueslis, fruity smoothies and freshly cut fruit”. Meanwhile, “to tackle hunger on the go”, the firm is also launching “indulgent salads” in varieties such as Sole Mio with fresh goats cheese, honeydew melon and a white balsamic dressing. Rounding off the new range are lines of ready and easy-cook meals including vegetable stir-fries, tagliatelle carbonara, Thai red curry, chicken tandoori, chicken tikka masala and three vegetarian soups. In March, Rewe announced it would be launching its new Rewe To Go chain, to be located alongside Aral petrol stations. 50 of the stores are set to open by the end of 2016, with a further 200 scheduled for completion in 2017.